Families living near airports whose children fly toy helicopters in their gardens could be fined up to £2,500 under new government plans that, er, flew under the radar during the ongoing Brexit chaos. A recent "correction slip" issued to change the government’s plans for new anti-drone laws removes a key protection from anyone who flies a toy of any size or weight within an airfield’s Aerodrome Traffic Zone (ATZ). At present, operators of drones that weigh less than 7kg are banned from flying within a 0.54 nautical mile (1km) radius of a licensed aerodrome such as Heathrow or Gatwick. But new Department for Transport plans will make it illegal to fly any drone within 2.5 nautical miles* (4.63km or 2.9 miles) of an aerodrome without air traffic control permission. People flying drones that weighed less than 250g would have been exempt from this ban – until DfT officials snuck out the correction slip last Friday (PDF, 1 page) and deleted the protection. The 250g weight limit is an EU measure which forms part of the bloc's own drone laws. 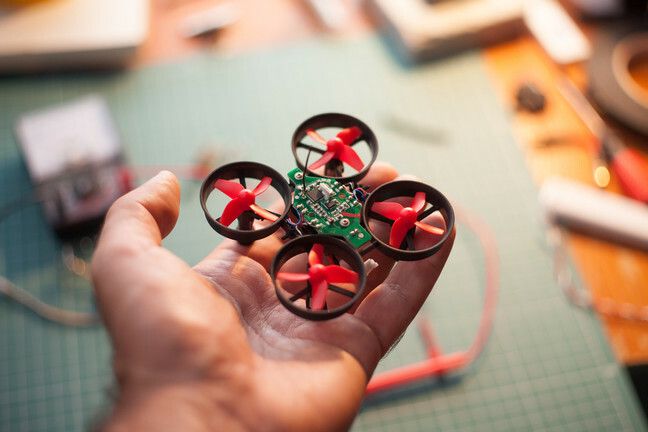 Virtually all drones under 250g are children's toys and are so small and light that they cannot fly in even a light summer breeze. A DfT press officer told us: "The CAA will be working with airports to review ATC permission processes as part of its larger review of this measure in the coming year, and the Department will keep the measure under careful review to check it is having the effect intended." Ian Hudson of drone website UAVHive told The Register that the DfT's decision was a strange one and did not take the impact on responsible drone users living near airports into account. * Aviation measures distances in nautical miles, altitude in feet, speed in knots (nm/hr) and lateral separation in metres. Drone operators measure distances in kilometres and heights in feet. Standardisation? They've heard of it.